Through the centuries, hordes of aliens and beasts from across the galaxy have descended upon Fantos in search of Iridium: the life force of all existence. The disease of war and greed has made the planet sick. Zodraz, the Cosmic Warden and protector of planets, is bound by duty to heal it. The parasitic inhabitants of Fantos must now prepare for the cleansing trials ahead. Only the brave and mighty citizens of the strongest Citadel shall survive. For when Zodraz arrives, all others will be burned from the planet. 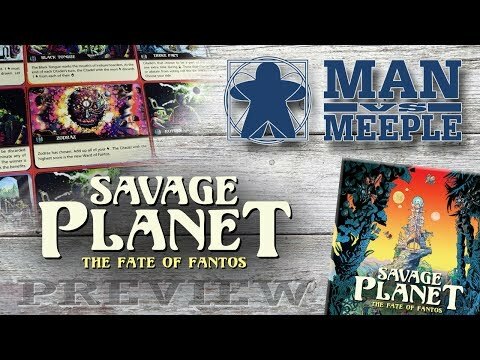 Savage Planet: the Fates of Fantos is a card drafting game with co-operative and competitive elements. Hire mercenaries (called Legacies) with shards from your Citadel and task them to harvest more shards, go to war with a neighboring Citadel or nominate them as the savior of Fantos. Every turn players reveal a card from the Trials Deck, bringing a new punishing challenge to the game. Resolve them together as a planet or watch as rival Citadels struggle to survive. Plan wisely and make every turn matter because Zodraz is lurking in the Trials deck. When the Cosmic Warden is drawn, judgement is passed and the game is over. 3-6 players, Eng - ? 3 players, Eng - ? 4 players, Eng - ? 5 players, Eng - ? 6 players, Eng - ?